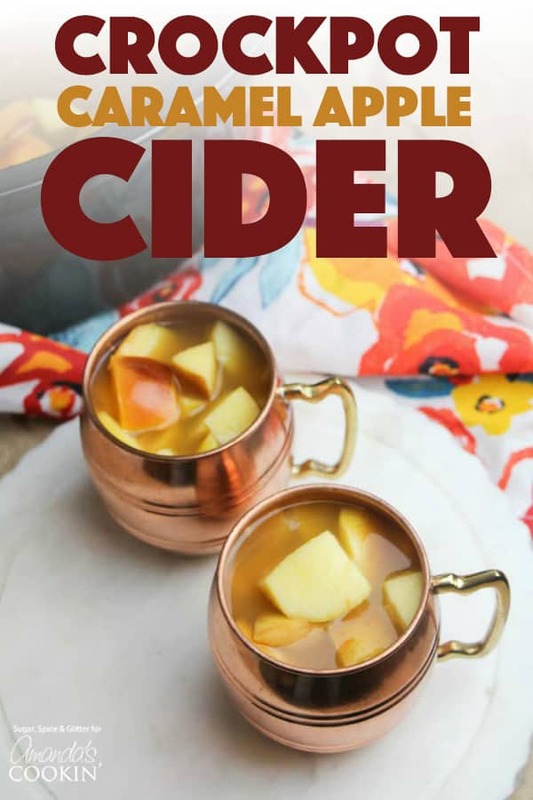 Crockpot Caramel Apple Cider: an incredibly easy apple cider recipe! If you’re a fan of Starbuck’s Caramel Apple Cider, we have a delicious fall treat lined up for you today! 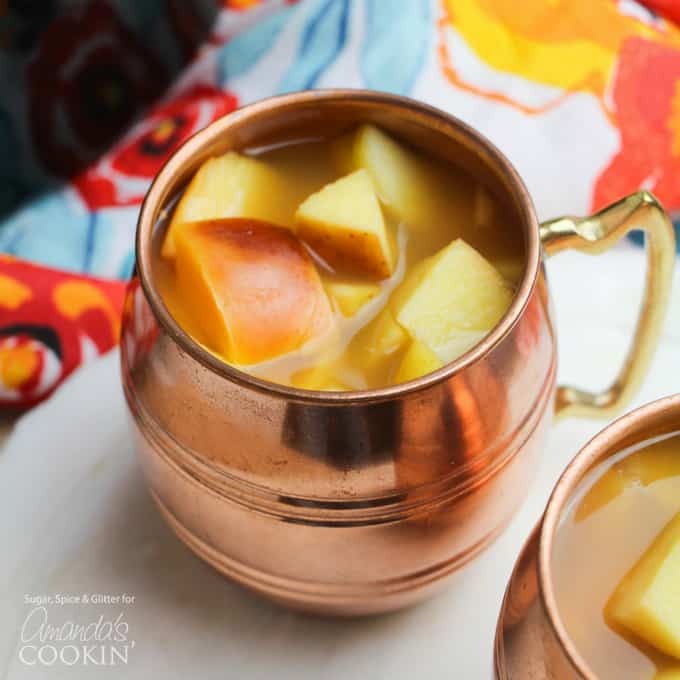 This easy Crockpot Caramel Apple Cider is the perfect warm drink to serve to a crowd this fall – and with no caffeine, kids can enjoy this delicious treat, too! 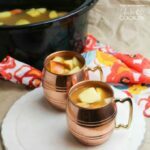 Both this Crockpot Caramel Apple Cider or our Hot Chocolate Cocktail would make awesome drinks to serve up for a fall or winter party. The minute the air outside starts to get cool and crisp, warm drinks go on high rotation in my house. Apple cider is a staple because it doesn’t increase my caffeine consumption and still keeps me hydrated throughout the day while providing a little extra warmth with every mug. 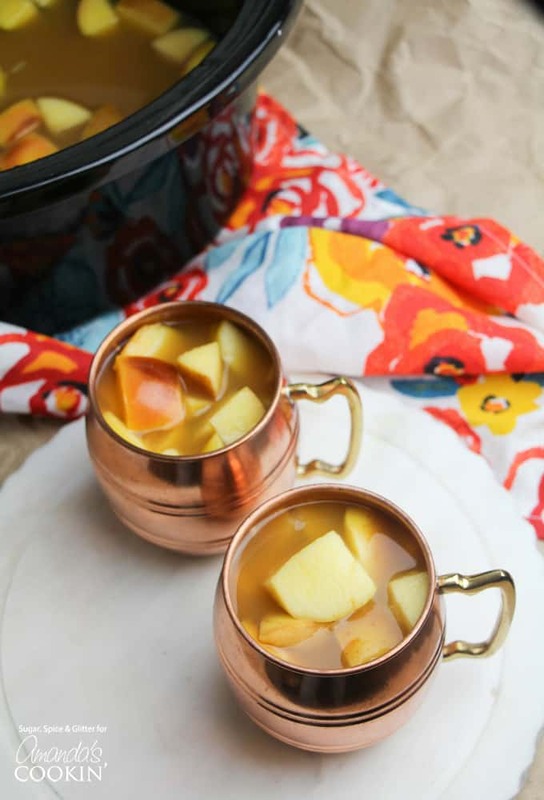 This Crockpot Caramel Apple Cider is great for serving to a group – whether your gathering is happening inside or outside, everyone will enjoy a warm cup of this sweet apple cider that tastes just like the expensive Starbucks version. 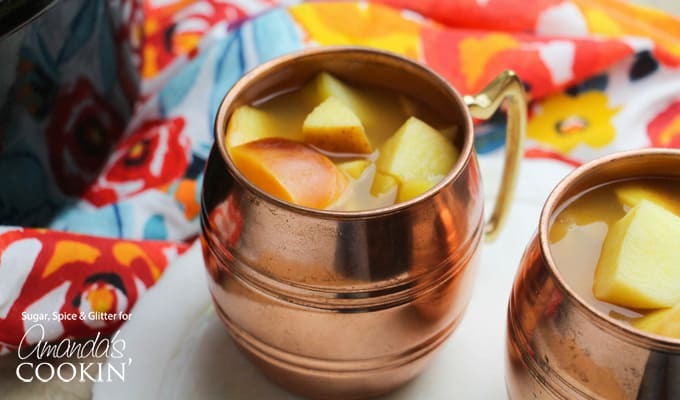 I like making this drink with fresh and perfectly cooked chunks of real apple in it so you almost get little bites of apple pie with your drink, but you can skip that (or just avoid ladling them out) if you prefer. Also, if you want to make this but don’t have apple cider on hand, you can use apple juice in its place. This Crockpot Caramel Apple Cider is so incredibly easy to make – just add all ingredients to your crockpot, stir and serve a short while later. Just throw it together just before your guests arrive and you’ll be able to greet them with a delicious cup. 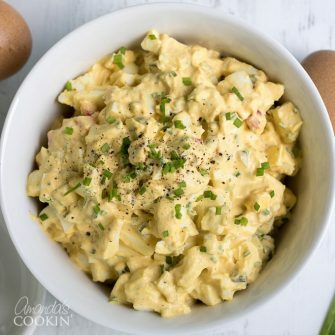 Have leftover apples? Make this warm apple crisp, another crowd favorite! Crockpot Hot Chocolate– with 3 different types of chocolate, this hot cocoa is the way to go! Slow Cooker Pumpkin Spice Latte– there’s really no need to say any more about this drink! Champurrado, Thick Mexican Hot Chocolate– a deliciously thick and creamy hot chocolate drink! Salted Caramel Coffee Cocktail– adding generous amounts of caramel and whipped cream to make this an indulgent coffee cocktail you can look forward to. This easy Crockpot Caramel Apple Cider is the perfect warm drink to serve to a crowd this fall – and with no caffeine, kids can enjoy this delicious treat, too! Place the cider in the crockpot. Add in the brown sugar and cinnamon and whisk until well incorporated. Chop up the apples and add to the crockpot. Cover and cook on low for 2 hours, or high for 45 minutes or until warmed through. Ladle into mugs and serve.